Two fireworks blasts kill at least 24 and injure dozens more in Tultepec, 20km north of Mexico City. At least 19 people, including rescue workers, were killed due to fireworks explosions in the municipality of Tultepec, a state official said on Thursday in the latest of a series of deadly blasts to hit the area known for its fireworks production. 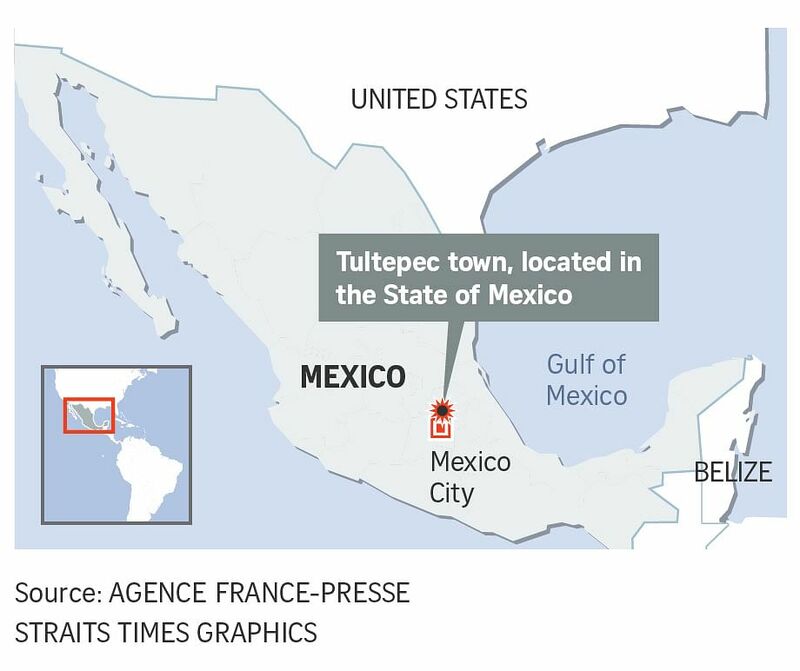 MEXICO CITY (AFP, REUTERS) - At least 24 people were killed in a series of explosions on Thursday (July 5) at fireworks warehouses in the town of Tultepec in central Mexico, including rescue workers who died saving others’ lives, officials said. The initial explosion occurred around 9.30 am (10.30pm Singapore time), then spread to other warehouses just as police and firefighters began attending to the first victims in the town, which is known for its artisanal fireworks – and a history of deadly accidents. “We deeply regret the deaths of those who were killed this morning in... Tultepec, including our firefighter and police colleagues who lost their lives saving those of many others,” read a tweet from the Red Cross in the state of Mexico, where Tultepec is located. The attorney general’s office for the state of Mexico, the country’s most populous state which rings the capital, said that 17 people had died at the blast site and another seven died in hospital. Another 49 people were injured, the statement added. An overpowering smell of gunpowder hung in the air, and charred furniture and bricks hurled through the air by the explosions could be seen lying in the grass, even outside the ample security perimeter. “I was having breakfast when there was a terrible blast. We left the house running and I saw a huge white cloud in the sky, as if it were going to rain – except today it rained fire,” said Alondra Perez, 62, who lives across the road. “People here insist on continuing to make fireworks. It’s their tradition. But they don’t gauge the consequences of these tragedies. It’s infuriating, because our firefighter colleagues... end up dead saving these people,” he said, speaking on condition of anonymity. Authorities suspended all fireworks sales in the area. The state interior minister said an “exhaustive review” would be carried out of all workshops’ permits. “We know it’s a way of life and a tradition, but we have to send the community the message, and they have to understand, that it must be regulated, for their own safety,” he said. Tultepec is known for making the fireworks that Mexicans traditionally use to celebrate holidays and saints’ days. It has been hit by devastating explosions in the past. And on Dec 20, 2016, 42 people were killed and 70 injured in a series of spectacular explosions at Tultepec’s San Pablito market, the largest fireworks market in the country. The market, which was filled with people shopping for Christmas and New Year’s festivities, was reduced to smoldering ruins.